In this post Cheyanne Scharbatke-Church shares findings from our new research examining corruption in the criminal justice sector in the Central African Republic (CAR). The systems analysis and findings discussed in this post shed light on how the 2013 conflict in CAR interacted with and impacted the system of corruption. Anyone who works in peacebuilding knows that conflict feeds corruption; it is a conflict context truism. It is generally understood that with conflict comes, amongst other things, diminished rule of law, more profiteering, greater basic needs, all of which drive or enable abuse of power for personal gain. Drilling down into exactly how these factors interact or mix with conflict dynamics themselves, however, is less explored. Our latest research examining corruption in the criminal justice system (CJS) in the Central African Republic [English, French] shines some light on these relationships. 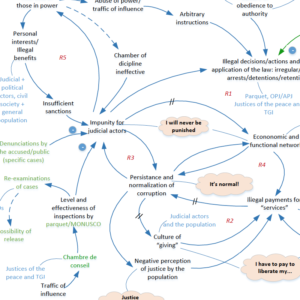 By using a causal loop map as an analytic lens to understand the system of corruption in the CJS, the interactions between corruption and the Séléka/anti-Balaka crisis became clearer. This is the third study of corruption in the criminal justice system in a fragile state conducted as part of the Corruption, Justice and Legitimacy project. 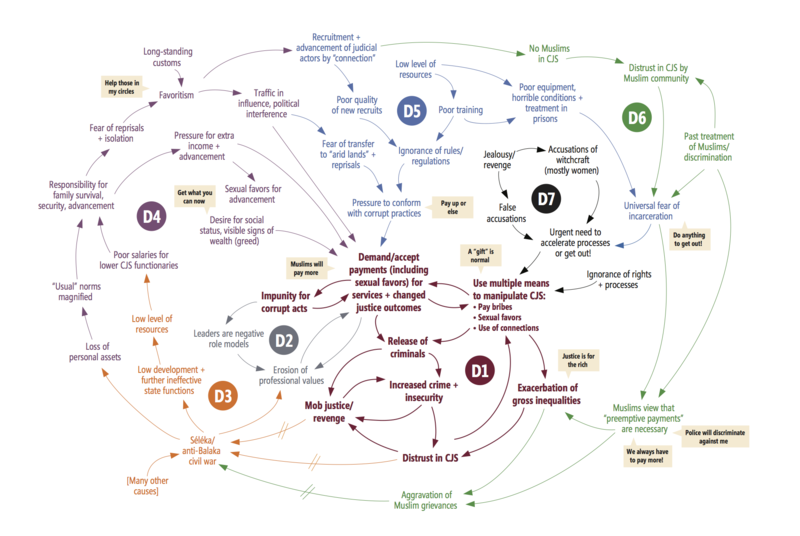 Using systems thinking, this effort is developing a corruption analysis methodology that seeks to catalyze more effective anti-corruption programming. The initial pilot occurred in the Democratic Republic of the Congo in 2014, and we have updated the analysis periodically; here and here. The Northern Uganda corruption analysis, Facilitation in the Criminal Justice System, was published in 2016. Why the focus on the Criminal Justice System? In some ways the corruption in the CJS (i.e. this encompasses the full chain from police to corrections), mirrors other sectors within Central African Republic (CAR). Government services, where they are available, have been monetized across all government institutions; not just the CJS. 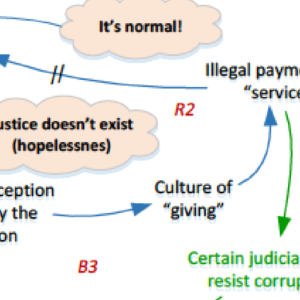 The unique feature of corruption in criminal justice, however, is that it allows official actors to take measures that deprive people of their liberty. 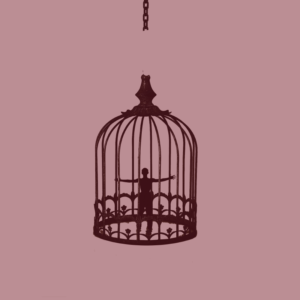 This power to imprison greatly influences the ways in which corrupt acts are implemented, and it also influences the causes and consequences of corruption. Not to mention, how could one tackle corruption in any other sector when those responsible for law enforcement are themselves on the take. To understand the relationship between the 2013 Séléka/anti-Balaka crisis and corruption, one needs a general understanding of the CJS corruption dynamics in CAR. 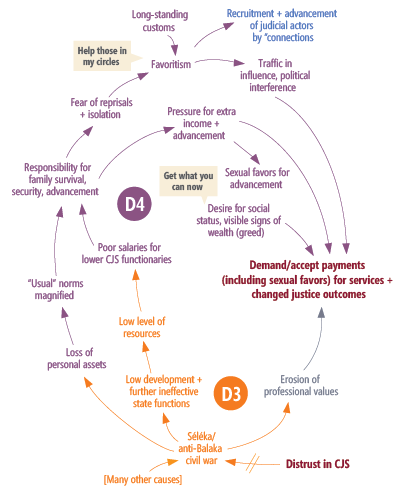 There are many elements that mirror corruption in the CJS in other fragile states. Criminal justice actors like policemen, judges or prison guards, demand and accept payments, including sexual favors, in return for a service, privilege or outcome. 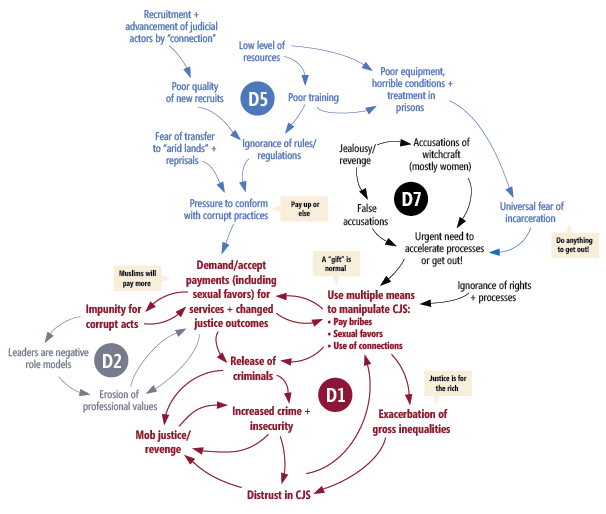 Many of these de-facto ‘taxes’ are charged for basic functions such as to file a complaint or receive food in prison. Greater amounts exchange hands when changing the outcomes of a file are involved; the amounts commensurate with severity of the crime. Actors justify their actions by pointing at the lack of resources, poor or non-existing equipment, and ignorance of rules and procedures by criminal justice actors and citizens alike. In CAR, extortion/bribery are clearly the most common form of corruption in the CJS. Women assert that sexual favors follow in second place while men locate favoritism as second. Anyone who can, combines tactics, e.g. fiscal with influence, to maximize the likelihood of securing their desired outcome. Pressure is brought to bear on the authority in question to secure the outcome of the financial “contribution” using connections, preferably familial, but also ethnic. Without the presence of an intermediary with influence it is just as likely that a bribe will “get eaten,” as it is to secure the intended outcome. Extortion by criminal justice actors and the manipulation of these actors by citizens contribute to unjust release of criminals, which increases the sense of insecurity and potential crime in communities; especially given the propensity for retaliation in CAR’s capital, Bangui. This has two deleterious effects; the increased use of mob justice and the erosion of the trust in criminal justice institutions; which in turn exacerbates the use of mob justice. Impunity for crime and for corruption plays a heavy hand in this negative dynamic increasing the amount of extortion, and exacerbating the perception of negative political leadership. Where does the Séléka/anti-Balaka crisis fit in? The Séléka/anti-Balaka crisis had professional, personal, and societal impacts that reverberated throughout the system of corruption in the CJS. Professionally, the final semblance of professional ethics – a central pillar underscoring justice — in the CJS fell away. Personally, the loss of wealth (e.g. houses, cars) from the crisis created a need (real and perceived) to quickly recoup one’s assets; using whatever means possible. This sense of scarcity and loss magnified existing norms in Bangui that indirectly support abuse of power for personal gain (i.e. corruption). Most importantly, the responsibility to ensure extended family survival and advancement became even more intense for those who were seen to have access to lucrative opportunities. In this context, refusing to help a relation, personal connection (e.g. same ethnicity) or colleague is not taken lightly; leading to isolation and possible reprisals. At the same time, the impact of the crisis and violence at a societal level also heightened the sense of insecurity and the pressure on individuals to help their families in any way they can. The crisis destroyed infrastructure, further diminishing the effectiveness of all state functions. This reduced the level of resources available within the government, which was already meagre. A reduction in resources negatively affected criminal justice actors, and particularly lower level ones; salaries were unpaid for months at a time and standard cost of living raises were halted. With heightened pressure for extra income, the demand for illegal payments also increased as did the demand for advancement to assignments that offer the possibility of enrichment. Advancements were, and still are, commonly obtained through favoritism, but it was reported that sexual favors are also used as a means to the same end. The Muslim community has almost no representation within the CJS. 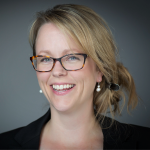 Groups without contacts “on the inside” have little opportunity to gain entry to the profession because hiring and internal advancement are predominately dictated by connections. This favoritism-based model establishes expectations for future interactions that reverberate throughout the functioning of the system. For instance, accessing professional opportunities, like training programs supported by the international community (read: hefty per diems), is dictated by loyalty-based arrangements and obligations. The absence of representatives of their own community, who can use their influence on their behalf; is one cause amongst several, that generates a distrust in the criminal justice institutions. This distrust is reinforced by the past treatment and discrimination experienced by the Muslim community at the hands of the police, courts and corrections. One of the ways that the criminal justice actors discriminate against Muslims is by demanding that they pay higher ‘fees’ than non-Muslims. Ironically, some in the police lament that due to the crisis Muslims are less present on the street and therefore it has cut into their illicit earnings. The collective result of the mistreatment is a palpable fear of incarceration; reinforced by a cultural sense of shame for members of the community who have been incarcerated. Moreover, it has created a negative mental model that filters every situation and dictates behavior such as “do anything to get away from the CJS.” Practically this means Muslims view “pre-emptive” payments as a necessary part of any interaction with the CJS. These dynamics exacerbate inequality and the perception that justice is only for the rich and connected. This causes friction in many ways, one of which being those external to the Muslim community, perceive the Muslim community as buying their way to impunity. For those within the Muslim community the persistent corruption amongst the CJS feeds Muslim grievances—grievances that the 2013 crisis shows can erupt into violence. The next post in this three-part series on CAR will look at the role of connections, obligations, revenge and retaliation as an important dynamic within the system of corruption. Findings are based on 115 interviews conducted in Bangui over the summer of 2017. 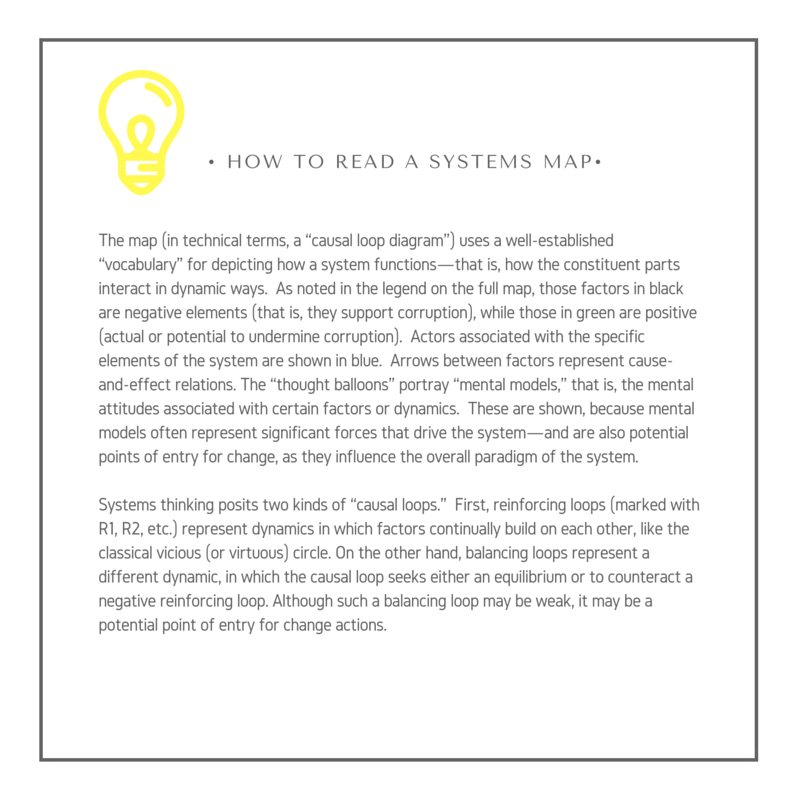 In addition to standard qualitative coding, casual loop mapping was used as a means of analysis. The final report was authored by Ladislas de Coster, Cheyanne Scharbatke-Church, Kiely Barnard-Webster with the support of Kessy Martine Ekomo-Soignet, Peter Woodrow and Arsène Sende. It is available in English and French.